At the U.S. Grand Prix on Sunday, Red Bull driver Max Verstappen climbed from 17th all the way into third after a grid penalty. But the podium Verstappen took away on the last lap didn’t last long, since Formula One race stewards decided his pass on Kimi Raikkonen wasn’t fair. Here’s that pass, from every angle. That’s a hard call, honestly. It’s easy, and almost expected, to at least run over the rumble strips when you’re racing on a road course, making for a blurred line on what should and shouldn’t be called. 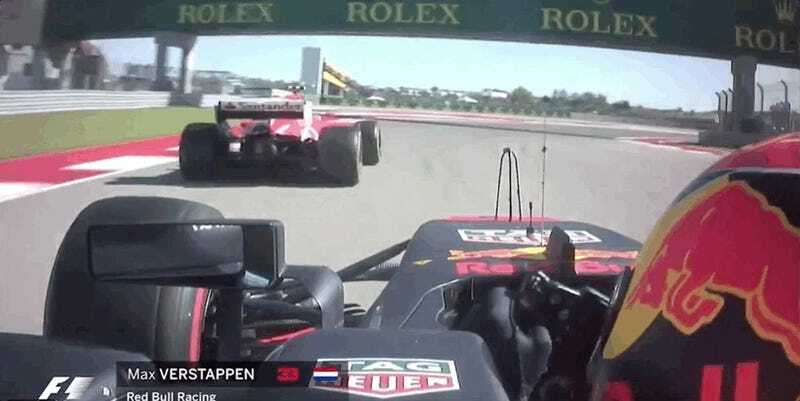 Either way, with how excited people were about Verstappen’s comeback run, they probably wouldn’t have noticed a non-call on this one.